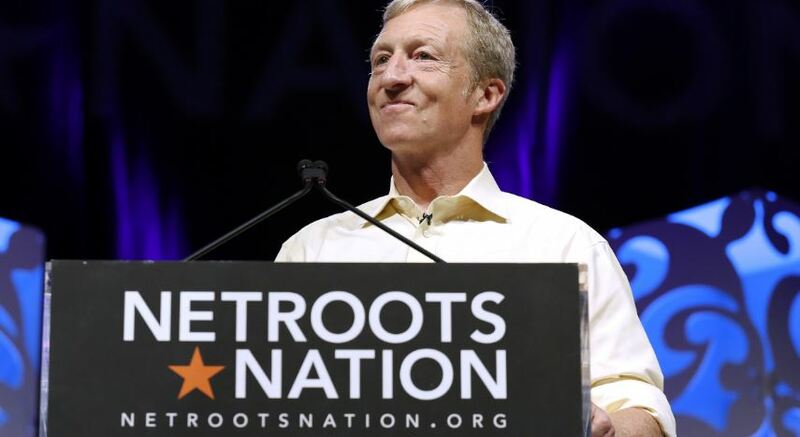 Billionaire Tom Steyer is launching a series of town halls promoting what he considers the five fundamental rights that corporations have stolen from Americans over the past several decades. Steyer announced the move in a full-page ad Tuesday in newspapers across the country. His ad focuses on education, the environment, voting rights, the economy and health care. The campaign comes amid speculation the former hedge fund manager is gearing up for a 2020 White House bid. “These rights are fundamental to our shared belief in the promise of America, a promise of the freedom and power to pursue our dreams and earn a fair share of this country’s vast wealth,” Steyer said in a press statement. The Tuesday launch also includes a six-figure web ad buy on Facebook, YouTube and other social media, Steyer spokesman Aleigha Cavalier told The Washington Post. “A hostile takeover of our democracy by large corporations and their enablers in politics has eroded that promise, and we must act to reclaim that power and put it back in the hands of the American people,” Steyer added in the statement. The Democratic money man created political advocacy group NextGen America in 2012 and has plowed more than $100 million into various political campaigns since 2016. Steyer has seen little success on this front, as many of the candidates and initiatives he has promoted in the past have fallen flat. Steyer forked over more than $5 million into Tallahassee, Florida, Mayor Andrew Gillum’s unsuccessful gubernatorial run. Gillum was one of a handful of Democratic candidates pushing for President Donald Trump’s ouster – Steyer devoted millions of dollars to a campaign dedicated to impeaching Trump. Steyer also has a poor track record of backing successful campaigns. He spent about $86 million in the 2016 election cycle, for instance, in a losing bid to get Democrats elected. His political group NextGen Climate, meanwhile, spent about $56 million in 2016, according to campaign finance data.